Home General Articles Should You Wear a Medical ID for Thyroid Disorders? January is Thyroid Awareness Month! Did you know? Thyroid diseases are very common and affects as many as 30 million Americans. The thyroid is considered as the master gland of metabolism and energy. Depending on the type of thyroid problem, the gland may be overproducing or underproducing thyroid hormone. Symptoms include heart palpitations, higher blood pressure, or fatigue. Although rare, thyroid emergencies are life-threatening conditions such as myxedema coma resulting from severe deficiency of thyroid hormones or in contrast, thyroid storm. According to the National Center for Biotechnology Information, the recognition of hypothyroidism may not always be easy in the emergency department setting. Thyroid disease is mostly an invisible illness which means symptoms may not always be visible to others – including to emergency responders. Medical ID bracelets or necklaces are recommended for thyroid disease awareness. In an emergency, medical alert jewelry can alert first responders of thyroid disorders and help facilitate timely and accurate treatment. Medical IDs can also contain information about thyroid medications and/or hormones to help avoid unwanted drug interactions. Prescription drugs that may interact with thyroid hormone include antidepressants, insulin, cholesterol-lowering drugs, and anticoagulants. People living with thyroid disease experience unnecessary stigma around this medical condition. 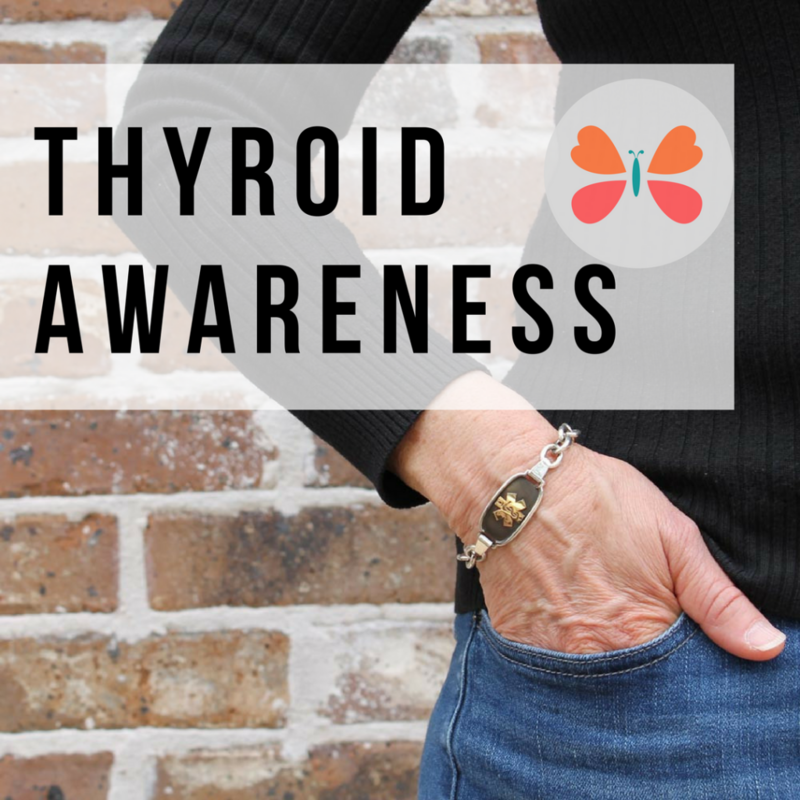 Blogger and Thyroid Advocate Rachel Hill writes, “It already can have a stigma attached to it as being easy to treat and not a big deal. And some people think it can be used as a medical excuse for being overweight”. Thyroid Awareness Month is a good opportunity to raise awareness that thyroid disease is a serious medical condition. People living with thyroid disorders experience a myriad of symptoms that may not always be visible. In some cases, thyroid disorders can even lead to emergency situations. It is recommended to wear a medical ID for thyroid disease for safety and peace of mind. Take a moment to give thyroid patients a voice. Leave a comment below or share this post to spread the word. awareness month, health tips, medical ID, medical ID bracelet, medical ID jewelry, thyroid disease, thyroid disorders. Bookmark.